Here at The Belmont Bark Academy for Dogs we believe that training should not only be effective but also fun for you and your pet! That is why our trainers only use positive reinforcement training. Positive reinforcement training uses praise, treats, and/or toys to reward your dog for doing something you want him or her to do. Because the reward makes your dog more likely to repeat the behavior, positive reinforcement is one of your most powerful tools for shaping and changing your dog's behavior. We do not use correction devices such as shock, prong, or choke collars. Though these devices can be effective, they are not needed in our Basic Manners and Obedience Training Programs. 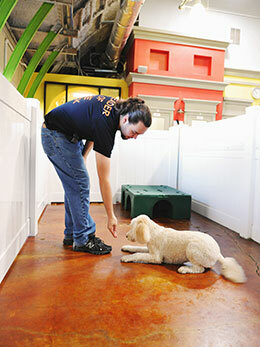 Our trainers will work with you so that you can easily understand and implement the commands your dog is learning. 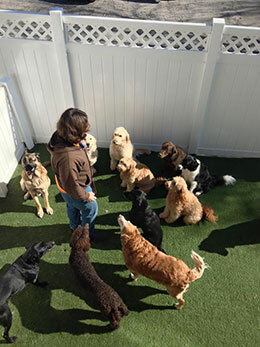 Dayschool is done on the same day your pup comes to daycare adding convenience to fit into your busy schedule. Your dog will be pulled from daycare to work one-on-one with a trainer and then return to the play group once the session is complete. We teach basic manners and obedience every dog should know. Dayschool is a great alternative to group classes as the trainers teach at your dogs pace and can tailor the sessions to focus on commands your dog may be having difficulties learning. Homework will be sent home after each lesson along with a report on how your dog is progressing. Commands include but are not limited to; Sit, Down, Stay, Come, Leave-It, and Loose Leash Walking. *Price does not include daycare fee. 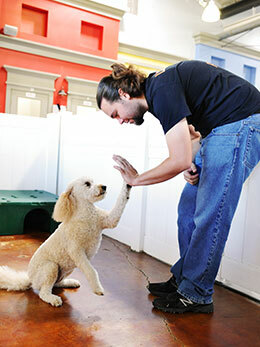 Our Board & Train is an extensive training program that teaches your dog the basics and more!! Our Board & Train program not only trains the dog, but the handler as well. 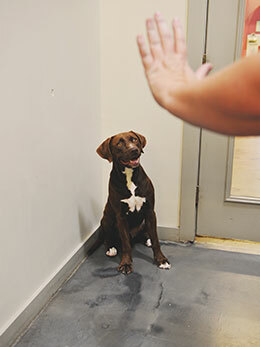 By learning positive behavior and basic obedience from our trainers, your dog gets to succeed from the very beginning. After working with your dog in our intensive 2-week program we then teach the family how to implement the new commands and how to deter bad behavior. Your pet will work one-on-one with a trainer twice a day plus be expected to follow direction from the Pet Assistants while out in daycare and in their suite. We will work on the basics such as Sit, Down, Stay, Come, Leave-It, and Loose Leash Walking. We will also teach the dog to "Wait" for items such as food and toys and take these items gently. We will deter negative behavior such as rushing through doors, jumping and leash re-activeness while out in public. At the end of the 2-week program a trainer will come out to your home and teach family members how to implement your dogs new training. * Price does not include boarding fee. Board & Train is not available during holiday or peak times. Private Training lessons are for owners that would like to have a more hands-on approach with their dogs training process. Obedience commands and behavior modifications will first be demonstrated by the trainer allowing a clear visual for owners before practicing the techniques for themselves. Besides basic obedience, private training can help with such negative behaviors such as; separation anxiety, jumping on strangers, barking and leash reactiveness. This is also a great alternative for shy dogs that need to build confidence, allowing them to become happy and well-balanced outside the home.